WADDINGTON, N.Y. - Gov. Andrew M. Cuomo and B.A.S.S. 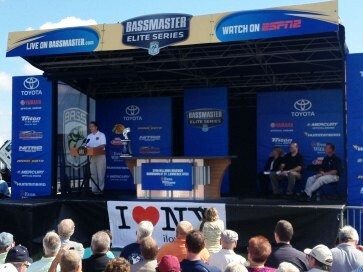 announced the Bassmaster Elite Series tournament will return to New York state in 2014. Under a partnership with B.A.S.S., the event will include the "Governor's Challenge," a fishing competition featuring the governor, other elected officials from New York and some of the biggest names in professional fishing. He said the events are intended to highlight and promote the state's many fishing and vacation opportunities. Following the success of the Governor's 2013 Adirondack Challenge, the Governor's Challenge will feature a tournament, fishing demonstrations and a banquet to lure in New Yorkers and visitors from out of state. The governor and B.A.S.S. made the announcement at the Bassmaster 2013 Elite Series Evan Williams Bourbon Showdown, which is taking place Aug. 8-11 on the St. Lawrence River in Waddington. The Governor's Challenge will be held next fall in the Finger Lakes to attract visitors to the Upstate region and boost the local economy. In conjunction with the Governor's Challenge, B.A.S.S. will also hold a Bassmaster Elite Series event. The tournament waters will be announced, along with the rest of the 2014 Bassmaster Elite Series schedule, at a later date. As part of the partnership, B.A.S.S. will provide a promotional media campaign that will feature these two events, as well as the many fishing opportunities and destinations all across New York state, Cuomo said. "From the Finger Lakes to the Hudson River to Long Island, New York is home to world-class fishing for all anglers and these destinations are waiting to be discovered," said Cuomo. An avid and lifelong fisherman, Cuomo enjoys fishing with his daughters. He and his daughter, Mariah, went bass fishing together on the St. Lawrence immediately after the announcement. Bruce Akin, CEO of B.A.S.S., said, "B.A.S.S. is pleased to join with Gov. Cuomo and the state of New York in promoting the great fisheries and vacation destinations all across the state. We have held numerous tournaments throughout our 45-year history and look forward to increasing our presence in the coming years. Our partnership with the governor is a great way to showcase all of what New York has to offer to anglers from around the world, and with this announcement, we invite them to join us next year for what will surely be an exciting event in the Empire State." Cuomo told the crowd of city and St. Lawrence County officials that fishing is a $1.8-billion industry in the state, much of it from tourism, and it employs nearly 17,000 people. "That is why we are holding this exciting competition next year: to draw much needed and deserved attention to the beautiful and diverse fishing spots in New York. No matter who comes out victorious, New Yorkers will be the true winners in the 2014 Governor's Challenge. This event will help grow our tourism and fishing industries and attract revenue to the Upstate communities that need it most. I thank B.A.S.S. for their investment in the Empire State and look forward to making this event a 'reel' success." He also congratulated the community leaders for bringing the Evan Williams Bourbon Showdown at the St. Lawrence River to the region. "For sure, St. Lawrence County and Waddington 'reeled in the big one' when they brought the Bassmaster Elite Series here." The Bassmaster Elite Series and the Governor's Challenge events will build upon other fishing-related initiatives spearheaded by the governor and intended to boost interest in fishing and traveling in New York. Recently, the state released an updated I Love NY Great Lakes Fishing brochure to guide anglers on where to fish and what to fish for in New York. The State Department of Environmental Conservation (DEC) is also updating its "Getting Started in Fishing" brochure to help the next generation of anglers; it will be available online and at fishing clinics. DEC's Division of Fish, Wildlife and Marine Resources is updating its website to make it easier to find information about fishing and to provide additional information about where to go. In 2012, Cuomo signed legislation to provide more free fishing clinics in New York, introducing people of all ages to the sport and promoting participation in recreational angling. Free fishing clinic events are available year-round statewide. This year, the governor announced "NY Open for Fishing and Hunting," which was passed as part of the 2013-14 state budget. The initiative streamlined hunting and fishing licenses and reduced sport license fees while maintaining support for the state's fish and wildlife programs. The Showdown, the seventh of eight Elite events of the 2013 season, began Thursday with a 6:30 a.m. launch. The weigh-in begins at 3:15 p.m. at Waddington's Whittaker Park, which is also hosting the Taste & Talents of the North Country Festival at the park during all four competition days. Chris Bowes, B.A.S.S. senior tournament manager, who introduced Cuomo, pointed out that more than 100 vendors are taking part in the festival.